Giampaolo Tonello visited Manching in Germany to check out the small public event and specially painted jets celebrating 50 years of WTD 61. This year marked the 50 year anniversary of the Wehrtechnischen Dienststelle 61 (WTD 61), the Luftwaffe's experimental unit. WTD 61 was established on October 1st, 1957, on the Oberpfaffenhofen Air Base. In 1965-1966 the unit was moved to its current home at Manching, near Ingolstadt. The main focus of WTD 61 is the evaluation of aircraft, helicopters and their weapons system for operation with the Luftwaffe as well as future development projects in which Germany takes part. The EFA/Typhoon is one of these for example. Manching is also used by the European industrial consortium EADS (European Aeronautic and Defence and Space) and the Messerschmitt foundation. To celebrate WTD 61's 50 years of existence, a small event was organised on September 15th with a static and flying display of the Luftwaffe's inventory and some warbirds of the Messerschmitt foundation. 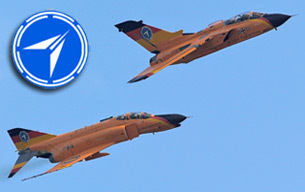 Stars of the display and static show were the F-4F and Tornado painted in an orange special livery with many scientific formulas on it to commemorate the unit's anniversary. The flying display started with some oldtimers, in particular the BF-109G-10, the BF108 Taifun and T-6 Texan. Interesting were the new attack helicopter Tiger and the NH-90 displays, with a formation flypast together with a CH-53 and UH-1. In the end the Luftwaffe's newest fighter, the Eurofighter EF2000 (EFA), showed us its capabilities right after the display by the F-4F Phantom II. It certainly was a very nice and impressive display, but... the old fascinating Phantom will always keep its place in our hearts!